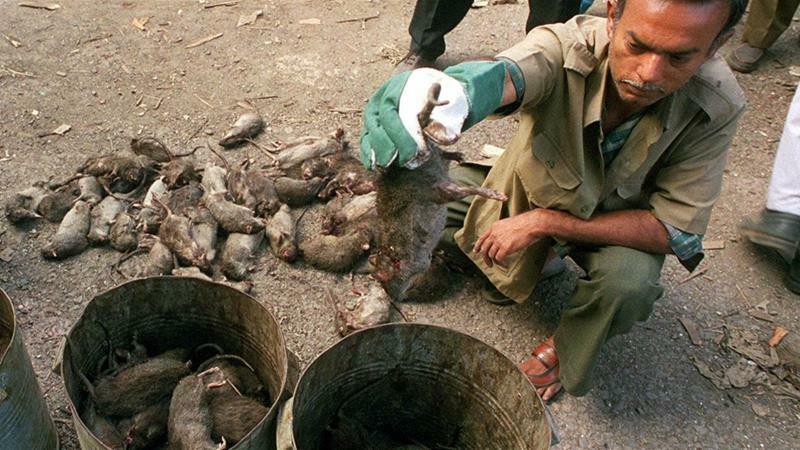 Narrator reports that parts of India which have experienced severe flooding recently are now plagued by a wave of rat fever, or leptospirosis, which is suspected of killing dozens of people, with at least 11 deaths from that bacterial contamination of the water confirmed. The bacteria is spread when rats and other animals either urinate in flood waters or drown in them, releasing the microbe which then can enter the eyes and small cuts in the skin of humans. Typhoid and cholera outbreaks can also be spread under the same conditions, and penicillin is given as a preventive measure when possible. Please may your healing mercy continue and let the natural strength of the people come through. Such wonderful, beautiful, intelligent people. I wasn't aware that the Hindus have their own festival of lights in November. Isn't it interesting how many cultures celebrate such a festival approaching the winter solstice? The Watchers article which Jim linked specifies that 58,000 people have been forced from their homes by the flooding, which also damaged schools and medical facilities. The people are without safe drinking water, while farmland, which had been baked hard over the drought-stricken summer, has been washed away. North Korea, a Socialist nation once united with South Korea until the end of WWII, found itself occupied by Japan during the war, and by Russia afterward according to the Wikipedia article on that country. The Korean war which followed concluded with a ceasefire but no formal treaty. Both North and South Korea are member states of the U.N., and both have nuclear technology, while North Korea's atomic weapons program is more developed. The separation of the two powers does have significant historic precedent, as they were two different kingdoms a millennium ago. The Zetas refer to the Koreas as one geographical unit, noting that the peninsula tip occupied by South Korea will be at greater risk of inundation, with few being expected to survive. They further caution that numerous inland locations even at higher elevation will be under water, so that leaves the central mountains of North Korea as the best proximate hope for refuge. Fortunately, earlier this year the two Koreas began engaging in formal peace talks, which may lead to border fluidity in time for southerners to make their way north. The leaders of North and South Korea at their third peace summit this year. 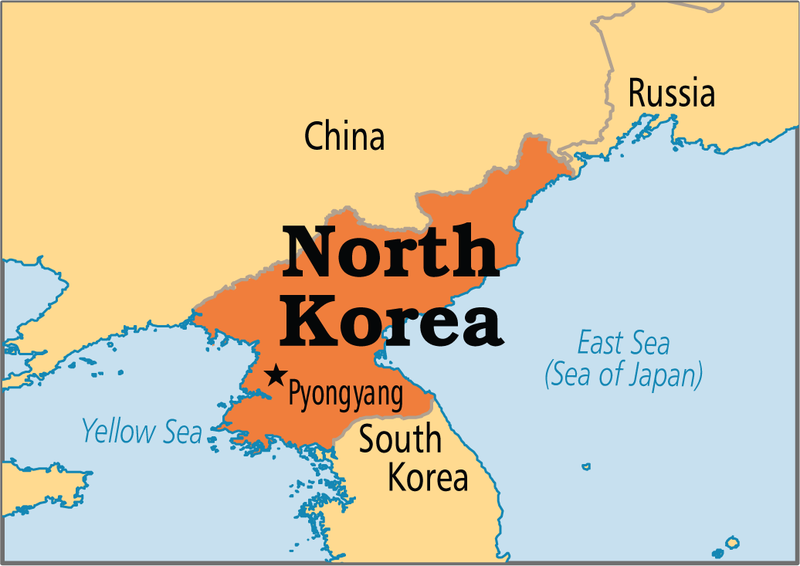 Luckily, North Korea is largely covered by mountains, with the range furthest from the coastlines being the centrally-located Rangrim Mountains which peak at over 7,700' above sea level. These mountains have abundant water resources, and are sparsely populated, with the majority of North Koreans living in the plains below. A variety of woodland game is available to those survivalists willing to brave the cold plateau climate. 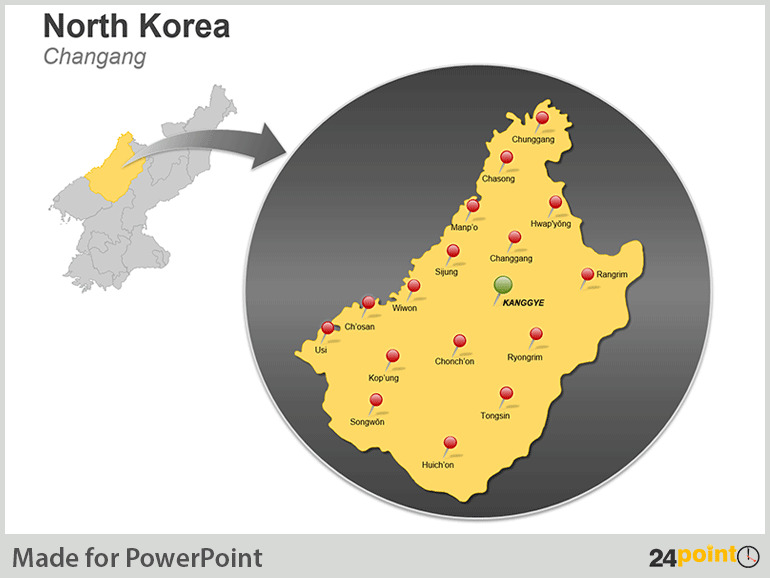 Kanggye / Changang Province is the furthest province from the coastlines of North Korea. The Rangrim Mountains are located in Rangrim County of Kanggye / Changang Province, a county in which the lowest point above sea level is in excess of 3,200,' affording significant loft above other non-volcanic portions of North Korea. As cold as winters are there, the growing season is similar in length to the Northeastern U.S., allowing potatoes, corn, barley and wheat to be grown, as well as unlimited game hunting. Rangrim County is centrally located in the highest mountains of Kanggye / Changang Province. It is shown toward the right side of this province map. The Korean word for the county means "wolf forest." May the rain in the affected part of North Korea cease for now, and may an outbreak of water-borne illness among North Korean refugees be averted. May the scale of the flooding serve as an alert to survivalists in that country, as well as in South Korea, that it is time to head away from coastal areas and move upward in elevation toward the continental mainland. May peace overtures between the two Koreas genuinely prosper and pave the way for greater cross-border mobility for South Koreans. More prayers for Japan right now in the wake of the 6.6 quake and deadly landslide. The link that Jim provided said that as of today, water levels were continuing to rise, and are presently at the 36' mark above flood stage. Thousands of people have been displaced from their homes, and large tracts of farmland have been destroyed. 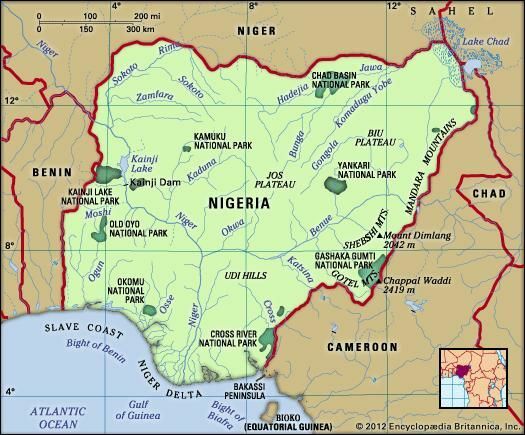 The Wikipedia article on Nigeria explains that Nigeria was originally inhabited by numerous tribes which were artificially divided by the British into two kingdoms that united upon declaring independence: the northern Islamic and the southern tribal state. The nation struggled in the latter half of the 20th Century for political stability, and appears just recently to have achieved it. Nigeria is the most populous country in Africa, and about equally balanced between Christians and Muslims, though 500 ethnicities and languages exist. While it ranks low in development, it is an oil producer and an emerging regional power with a half-trillion $ GDP and a low debt ratio, making that country more solvent than some developed countries. It is a member of the International Criminal Court, though its own human rights record is imperfect. It also possesses its own stock exchange. 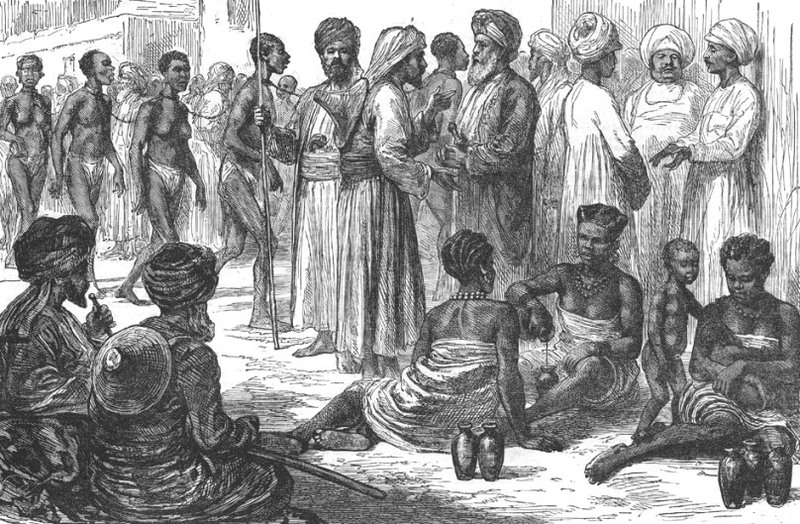 Britain's non-interference policy with regard to Muslim cultures left an odd cultural mismatch which allowed Islamic northern Nigeria to continue its slave trade well into the 20th Century long after southern Nigeria had abolished it. Christianity (Some Yoruba ) ...............................................................The U.S.A. The smaller indigenous tribes to the east eventually came together as the Igbo people in a peaceful system in which monarchs practice servant-leadership and accountability to populist advisors. In spite of this, the Igbo are the demographic that have suffered the most hunger and disease in the modern era. The Zetas predict severe hurricanes and flooding in the south and along the coast to the west, as well as tidal bore up the rivers. Migration eastward and upward, to the greatest extent possible, is advised. Because the northeast is a desert and the southern tip doesn't extend inland far enough for safety, the central portion of the eastern boundary of Nigeria appears to be the safe location. At nearly 8,000' in elevation and nearly 600 miles inland, Chappal Waddi is the highest point in the entire region, satisfying the advice to move in and up. It is located in the state of Taraba on the border of Cameroon, with which southern Nigeria enjoys a close diplomatic relationship. Chappal Waddi is part of the Mambilla Plateau, and is located in Sardauna County of Taraba State. Chappal Waddi has been inhabited by the same Bantu-speaking tribes for 4,000 years. It is a temperate location which reaches a maximum of 77o degrees F, in spite of being equatorial. Though windy at that altitude, the mountains enjoy rain throughout the long growing season, and then dry winters. And there are no mosquitoes or Tse-Tse flies, unlike elsewhere in the region. Farming on the Chappal Waddi includes the raising of cattle and numerous crops. May the people of Nigeria take heed from the catastrophic floods that it is time to seek higher ground. May they gather their families and remove themselves from the dangers below in order to settle among the Bantu-speaking communities with their ancient agrarian ties to Chappal Waddi. May the coming pole shift in some way provide a cleansing of the trauma of slavery from the land, and may bloodlines that descend from slaves be the ones to govern in the Aftertime. The article that he linked states that though the area had experienced several weeks of torrential rain, the displacement of as many as 100,000 people was actually triggered by a sequence of water releases from a dam upstream across the border in Burkina Faso. According to Wikipedia, Ghana was known first as the Portuguese Gold Coast, then the Dutch/Swedish/Danish/Norwegian/German Gold Coast, and finally as the British Gold Coast during the colonial period, until independence was achieved in 1957. Since then, the predominantly Christianized, largely Charismatic nation has become a regional power in its own right, technologically advanced with its own space satellite program and motion picture industry. Progressively, and likely deeply rooted in the country's culture, the government has its own institute and outpatient clinic for the study of herbal medicine. Also progressive are its universal health care and civil rights. Famous actors in the Ghanaian, and international, cinema. As is common with developed nations, the proportion of agriculture in Ghana's GDP is relatively low with the major exception of cocoa bean production. With the blessings of technology unfortunately often comes loss of touch with the land, but the nation is blessed with coastal fishing waters to help make up for it. One group's Kente Cloth pattern. I especially like the one that means "By God's grace, all will be well" in these troubled times. 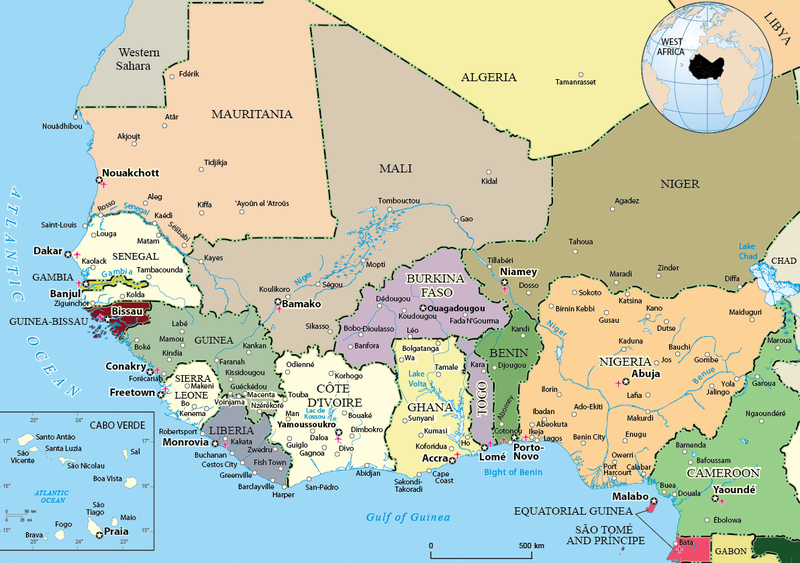 The Zetas' concerns about Ghana mirror those of Nigeria: A pole shift deluge is expected that will create unprecedented tidal bore upriver; hence the recommendation to move inland by several hundred miles and upward in elevation. To meet those parameters, it would be necessary to avoid east-central Ghana, with Lake Volta, the largest man-made reservoir in the world, being located there. Even the highest hills in Ghana are only 3,000' in elevation and very near the coast, with the neighboring countries also having relatively flat lands. Therefore, it may be necessary for survivalists in Ghana to make the journey to Chappal Waddi in Nigeria in order to reach the nearest high peak that is sufficiently inland. The shortest distance between Ghana and Mt. Chappal Waddi in Nigeria is 760 miles. 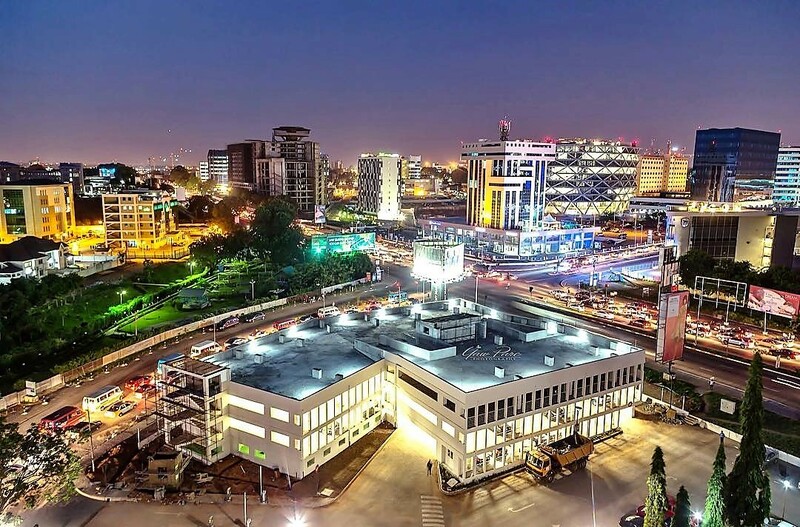 That could prove to be a challenge to Ghanaians, who are accustomed to a middle-class standard of living - one of the highest in Africa - to let go of their material comforts and learn to live with those in Nigeria who are land-rich and cash-poor. However, their existing positive diplomatic relations with other African nations may be an aid, as well as any transportable wealth in the form of goods that they might be able to carry with them as gifts to their mountain hosts. That, plus a willingness to learn subsistence agriculture, at least until the pole shift inundations settle down and it is safe to return home to Ghana. May the people of Ghana realize that they are in danger, not only from their own Atlantic Coast and massive inland reservoir, but also from the dammed waters of Burkina Faso above them. May there be those among the Ghanaian survivalists with linguistic skills and diplomatic inroads to the Bantu-speaking people of Nigeria, or to another safe location. May they be willing to let go of their relative material prosperity, a difficult thing to do, and embrace a different kind of wealth. May they be received with warm welcome by their hosts, wherever they do go. Part of the 2016 Ghana team at the International Olympics wearing Kente attire. Fascinating about the beautiful varieties of Kente cloth. And one would have to wonder how many Ghanians live right on or near the coast, and are they tsunami-savvy? Here's a new at-a-glance map of the world based upon population in each country, with each square representing 500,000 people. The civil war in that country had been briefly set aside shortly before 35,000 people in Sri Lanka lost their lives to the December, 2004 tsunami. With assistance from China, Sri Lanka launched its first satellite into space in 2012. The country is multi-ethnic, tracing its history back as far as 500,000 years. While Buddhism is legally recognized as holding a special status as part of the national heritage, freedom of religion is practiced. The indigenous Vedda tribe, otherwise known as the Forest People, are believed to be a remnant of the earliest inhabitants of the island. The populace of India, Bangladesh, and Sri Lanka will drown, and the countries on the Sunda Plate in harm’s way when the compressing Pacific pours water past the island nations on its way to the Indian Ocean. ...the floor of the Coral Sea will flex up when the plate is tilting again, then relax somewhat as the magma fills in and again supports the void, then straighten out as the bend point between Australia and India allows Sri Lanka to drop, then disburses and redistributes the magma under the Coral Sea which now has once again changed shape. Kalpitiya, the peninsula which separates the Puttlam lagoon from the Indian Ocean sits picturesquely bordering the north western coastal beach. With its 20 surrounding islands it is a beautiful stretch of land. Unfortunately, some of these islands have gradually begun sinking in the face of sea erosion. Wella, Palliyawatte and Battalangunduwa, with about 1,000 families settled on them and are among those which have begun sinking. The Zetas have indeed warned that taking to boats will be a survival necessity in many parts of the world. Centrally located Mount Pedro, at 8,281' in elevation, may offer an alternative to houseboat living. The very peak of that mountain is occupied by a military base that is off-limits to the public, but at over 6,100' up is a municipality called Nuwara Eliya ("The City of Light") with a population of 27,000. 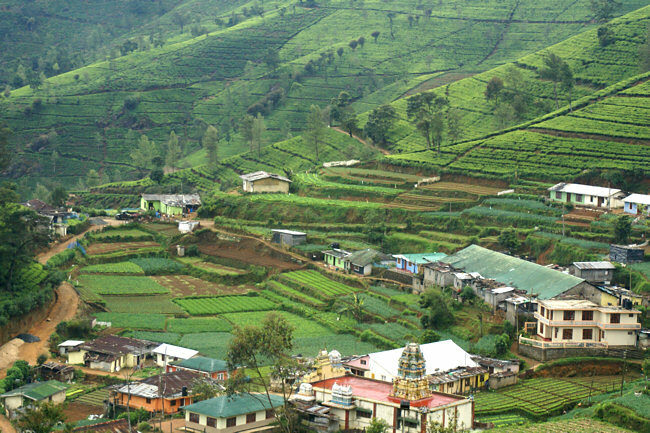 Numerous smaller agrarian communities exist in the rural outskirts, where tea and other important crops are grown. While the rest of the island is tropical, the mountain enjoys a wet temperate climate. 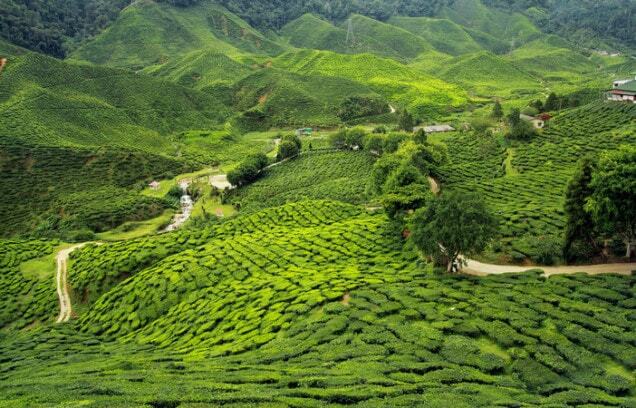 Tea plantation on Mt. Pedro. The province in which Mt. 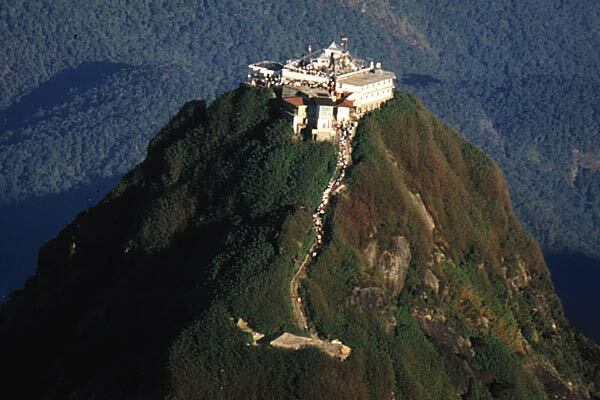 Pedro is situated is also home to numerous sacred sites, including the location of the writing of the first Buddhist texts and Adam's Peak, where Adam was believed to have been exiled from the Garden of Eden. Adam's Peak is sacred to all of the world's major religions, both Monotheistic and non-Monotheistic. One must walk up more than 5,000 steps in order to reach the summit. May the people of Sri Lanka take heed from the recent floods that they are in danger. May they either evacuate the island, possibly living a maritime existence, or move inland and upward in elevation, toward Mt. Pedro's sacred ground with its rich agrarian heritage where they may find abundance and beauty. Tea picking in the mountains.